As promised yesterday, I did at least one of the things I said I would do. The first thing I did this morning was fill up a clear glass of water. I then proceeded to spit into the glass to see what would happen after 15 minutes and then a half an hour. I had my husband do the same. The differences were astounding. I wanted to do a simple at-home test for candida (basically, an overgrowth of yeast in my gut) which can cause a whole slew of problems, including dystonia. It can also cause migraines, inability to focus, confusion, irritability, drowsiness, acne, and a slew of other problems... some of which I have and some that I do not. According to Dr. Oz, and several other sites, after spitting in a glass of water, if your saliva drops down to the bottom of the glass like a white web and/or is tentacle-like, you probably have candida (especially if you are experiencing other symptoms). Ladies and gentleman, here are the results of my saliva test from right after spitting, to a half hour after spitting into the glass. Immediately after spitting in the water, some of my saliva dropped to the bottom, causing a "cobweb-like" appearance, with some white specs floating in the water (left). After about 15 minutes, the saliva at the surface started to get whiter and drop down into the water (center). After a half hour, several pieces of white saliva dropped further down, some breaking off and settling at the bottom of the glass. This is not a 100% accurate test, but given I have many of the other symptoms of candida, a blood test would likely indicate a positive result for an overgrowth of fungus in my gut. About 70% of Americans have this problem and do not even know it. So I was certain my husband would have the same/similar results as me when he spat in his glass. Much to my surprise, especially since my husband and I eat generally the same diet, it came back "negative". His saliva remained pretty much clear, and stayed floating at the top of the water, indicating that there is no evidence of fungus overgrowth in his gut. While he has some of the same symptoms as me (especially fatigue), most of this can likely be chalked up to normal anxiety and fatigue due to working long hours at a stressful job. Now, to reiterate, this at-home test is not the most reliable way to determine whether or not you have candida in your system. There are various tests that can be ordered by medical professionals (i.e., blood and stool testing). I plan to ask my doctor about it when next see him. So, now what? I spent most of today researching Candida diets. It's actually pretty depressing, but people do live with it and there are some recipes out there that have some obscure ingredients, but people swear they're tasty. The bad news is I HAVE to stay away from foods I LOVE. I love pasta, pizza, breads, baked goods, cakes, ice cram and other desserts. Basically, my diet will need to be restricted to leafy vegetables, nuts, berries, organic poultry and certain types of fish. I'm trying to see this as a good thing... a realization that I may have unlocked something for dystonia and ASD sufferers alike. I'm considering working with a registered dietitian. There is something to be said about the brain-gut connection, and I need to take control of my future. Wish me luck! Today was the first truly wintery day in Buffalo, NY. As my husband and I sat in Tim Horton's this morning, it hit us, "it's here". He made a call up to Niagara University to make sure his staff was on top of the shoveling. The snow hadn't made it up to Niagara Falls yet. I had some things I wanted to accomplish this weekend, but didn't. I didn't go to the gym or work on any arts or crafts, but I did some reading and some research, while continuing in a contest to win tickets to see Ben Folds in Toronto this coming May. I started a book called Wherever I Wind Up, by Toronto Blue Jays pitcher, R.A. Dickey. I did this while clicking through Ben Folds music and YouTube videos to get points for a a contest I'm taking part in. Multitasking! I whipped through two chapters of the book. Chapter 2, outlining Dickey's horrific experience in 4th grade helped me put things into perspective in terms of things I went though as a kid. It made me realize how we all face adversities in life. I had to put the book down after that chapter... I'm eager to get back to it soon. I did some research on candida imbalances and am going to spit in a glass of water tomorrow morning to see if I have too much yeast in me. After reading about Candida and how bad yeast is for people, I realized it couldn't hurt to detox and completely change my diet. Initially, I was just researching natural ways to treat dystonia, but found that many of the things that a Candida detox can achieve may help me out with ASD as well as other related disorders and/or symptoms. I showed my husband a link from Dr. Oz, and he agreed he may be experiencing some symptoms of a candida imbalance as well. I'll write about testing myself for candida tomorrow. If I were to start writing my story today, what would I write? What have I done with my life? What will I do with my life? What should I be doing with it? The past two years have been a roller coaster ride. I decided on December 31, 2015, I was going to make a change. Every day is going to be meaningful for me in some way, shape or form. I will not be a competitive distance runner, though I can jog a bit right now. I can no longer sprint or pivot. I am accepting this with grace. This is a decision. I have chronic lower back pain. I'm a physically disabled Aspie. Being neurodiverse can be a gift and by sticking close to my faith, I will strive to be positive in the world; not for me, but for others. Everyday is going to be a movement forward. I may stumble or stagger, I may trip and fall, but every day I will do something, learn something, say something or create something positive regardless of the bad things in my life and in the world. Some days I may literally not be able to walk, but it's how I handle my suffering that will help change who I am. Every day will be a new day with a clean slate, and I have to always be able to roll with the punches. Today I researched supplements and vitamins to help both dystonia and ASD. I biked and did a 30 minute treadmill workout. I heated up some frozen homemade chicken soup for me and my husband. I've done more today than I have in a while. It's a physical and mental struggle. Life isn't easy, but I cannot give up. I intend to write every day, even if just a few sentences. I need to live the life planned out for me and choose to be more positive. I have a list of about 10 things I want to do to change myself and the world. To change it with a message of love. This won't be easy... but I need to try. I have been wanting to write about this experience for some time now, but I somehow always seem to forget. I have been working hard to rehabilitate my knee so I can potentially run again. I'm realizing that this will happen, probably sooner rather than later. As I am going through this healing and rehab process, I'm constantly reminded of an experience I had on Klein Road when I was 18 years old. Not only must I not forget it, but I need to share it. I was home from SUNY Albany for Spring break in 2002. It was unseasonably warm for March, and I'd left most all of my summer running clothes in my dorm room. Not even some forgotten running clothes could keep me off the roads, though. I headed from my parent's house, down the street, and made my way a couple of miles in a long-sleeved t-shirt and spandex. Beads of sweat were pouring down my face, and I realized I was becoming fatigued. As an Amherst Police car was about to pass me near Bassett Park, I thought about the "tough girl" cop I wanted to be. Proceeding down Klein Road, I was pushing my body to the limit and telling myself how I needed to work hard, fight, and run simply to win. The sweat, fatigue and sheer determination would pay off in my training. I was "good" and I knew it. It was if a whisper told me I had it all wrong. "Nicole, look what you have." I felt the beautiful late-afternoon sun on my face as my feet propelled me forward, gliding across the pavement. With each breath I took, as my feet lightly touched the road, a multitude of new thoughts filled my head. I was suddenly "flying". I came to an awesome realization. I wasn't on a "tough girl" training mission. Rather, I was experiencing a gift that God gave to me; the gift of being able to enjoy something as simple as putting one foot in front of the other in the form of running. From this "Lenten Run", as I like to call it, I learned so much. My attitude changed. It wasn't about my piddly 5k races and adding to my trophy shelf... it was about the simple, pure joy and ecstasy I was able to experience through the sweat, the fatigue, the sun, the air, and the beauty surrounding me in this little corner of the world as I ran. This was something I'd never experienced before, but have experienced many times since. I wondered how many others were out there, running, and experiencing the same feelings as me. This past November, I had a lateral release of my left kneecap so it could be realigned, along with the back of my patella smoothed out. It was pretty "beat up" as my surgeon put it. I've been in physical therapy for about a month, and making progress. I don't walk down stairs like a little old lady anymore. I can bike, walk and do some simple exercises to strengthen the muscles around my kneecap. I saw my orthopedic surgeon today. "Running might be in your future, down the road." To which I replied, "How far down the road?" "Maybe next summer." I couldn't believe it. "Maybe?" I just bought a cute t-shirt from Target that said, "Run Fast or Be Last" because it was only 7 dollars. I should be happy that I'm walking okay at this point... but running as a "maybe?" I know I'm not God's gift to the sport, but running has certainly been a gift to me. 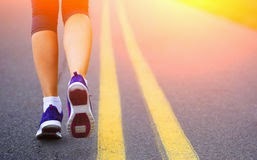 When I run, I feel better about myself, can think more clearly, and I just use it as my time to just relax and meditate. I cannot imagine this not being part of my future, and I don't know how to deal with that. "I can run just as fast as I can to the middle of nowhere, to the middle of my frustrated fears and I swear, you're just like a pill instead of making me better you keep making me ill...."
It's perhaps ironic that the song Just Like a Pill by P!nk was one of my favorite songs to run to during the winter of 2002/2003. The upbeat tempo combined with the lyrics were just so awesome to run to. I'm sure P!nk didn't intend for this to be a "running song", but for me, every time Just Like a Pill came on the radio that winter, I felt this rush of adrenaline and got this endorphin high that helped me push through my workouts despite below freezing conditions. My running got better and better. I set a few 5k personal records that winter. I reached two of my three goals for the Lockport Y-10 in February 2003 -- clinching my age group and finishing in the top 10 for all the women in Buffalo's toughest 10 mile race. A month later, everything started to change. My foot cramped up, my neck went into spasm, and my body started to tremor. As I traveled from doctor to doctor, I realized no one knew what they were doing. Just Like a Pill took on a whole new meaning, and it wasn't positive or upbeat. No one was making me better. Doctors were pushing pain medications that didn't work. A neurologist put me on steroids and Betaseron for my "multiple sclerosis". I got so sick from the treatments, and I felt like no one cared. No one was making me feel better... everyone just kept making me ill... I wasn't crazy; I just had dystonia. I was finally properly diagnosed in December 2004. But to this day, no one knows what dystonia is. It's "m!ssundaztood". Now, nearly 11 years later, I am still "m!ssundaztood". I can't explain what's going on with my brain and my body and the brightest medical minds can only theorize and speculate each individual case as no two people with dystonia are alike. Coincidentally, there is literally a pill that makes me ill. Unfortunately, it is one of the only pills that helps my dystonia. Klonopin slows down brain chemical activity. Some side effects of Klonopin are sedation, dizziness, weakness, unsteadiness, depression, loss of orientation, headache, and sleep disturbances. I have been on klonpoin for nearly 10 years and experience all of these symptoms along with grogginess and anger. Here's a YouTube clip regarding Stevie Nicks' dependency on Klonopin, prescribed by her doctor. She describes it as "more deadly than coke". I'm not myself while on Klonopin. I think I function about 60% cognitively in comparison to where I was when I was 20 years old. I get so sleepy and lack creativity. I'm "m!ssundaztood" by so many regardless of whether it's the dystonia, the drugs or a combination of both. A couple of years ago I attended a New Years' party with a bunch of people from Checkers AC. Most of them were my parents age or older. I had trouble making it to midnight. As the crowd dispersed for the evening, a number of people asked me, "Hey, are you coming to our 'resolution run' tomorrow morning?" I laughed -- were they kidding? I was beat -- weren't they? Looking back, they were serious. I was in bed the entire next morning. A lot of those folks got a few hours of sleep after a night of drinking and partying, and then went out running the next morning. I was only 28 years old. Runners in their 70's at the party didn't get me... I'm finally understanding that they can't. Dystonia and the drugs like Klonopin rob you of the person who you are. For the past three years, I've attended the Niagara University President's Ball with my husband and his department. My husband facilitates everything for the people in attendance at our table. It's his job. The ball is held at the Seneca Niagara Casino and is a really great event. I always try to be on my "A-Game", but by the time the dinner and speeches are over, I'm ready to call it a night. I need to head to the hotel room and sleep. The folks at our table understandably want to make the most of the evening by having a few more drinks while heading to the casino. This includes the director of the department, who is in his late 50's and has MS. What do they think when the account manager's wife isn't feeling well? Nate and I retreat to our hotel room. Nate receives text messages from concerned colleagues, "I hope Nicole feels better." It's like I put a damper on the evening every year. I hate what I do to people... but at the same time it's not my fault. The anxiety depression that dystonia and perhaps klonopin cause is the most difficult thing to deal with. I know there's an intelligent, energetic person inside me, but that person has been dormant for years now. I wish that person would come back to be the person who isn't so difficult to understand... the person who isn't "m!ssundaztood". Eight years ago I ran into an old high school classmate who did not recognize me at all. After jogging his memory a bit, he said, "I remember you! You were a runner; I remember you were really vibrant." Yes... vibrant... that was me a long time ago now. What I would give to have that version of myself back. ...and then I just wouldn't shut up. I was a quiet , soft-spoken girl who was afraid of her own shadow until about 26 years of age. I stopped being afraid to talk to people around then. The problem was, I just couldn't stop talking. I still don't stop once I get started. I've been told that it's enough to drive a saint to sin. Not only have I been told directly, but I've had nonverbal cues and even completely lost my train of thought while trying to tell stories. There's a supervisor in my office that I took the train in with for a while. I'd be so excited to see him every morning that while I was yakking away, I neglected to take notice of the fact that he had a book open in front of him. He'd always end up closing it, with the realization that he was not going to get any reading done as long as I was on the train with him. He never complained about it, but it just hit me one day recently, "He didn't want to talk. He wanted to read." Today I broached the topic of how I talk too much with the new guy in our office. I was probably on my third long-winded story with this guy since his start day on Tuesday. I stopped in mid-sentence and laughed, telling him about the train incidents with his supervisor and how I talked to him too much as well. His supervisor peeked his head out of his cube and said, "Now when I try to read on the subway, I just fall asleep." I am well aware of this problem, and yet I still somehow am not conscious of the fact that I am doing it as it is happening. Then I wonder why I don't have many close friends. I'm nearly impossible to have a conversation with, though I do listen to people. I do care. I'm entering another long weekend. My husband has to work again. I don't want to feel sorry for myself, but I guess I kind of do. I am not an easy person to be around, and I'm often living in a fantasy world designed in my head. I need a reality check. I need a new project and a reason to get out of bed tomorrow morning. Right now I just don't have any idea what I'm supposed to be doing to keep myself occupied and happy. I'm a 30-something from suburban Western New York... life is good! On top of Mt. Royal! Nicole Oliver. Travel theme. Powered by Blogger.